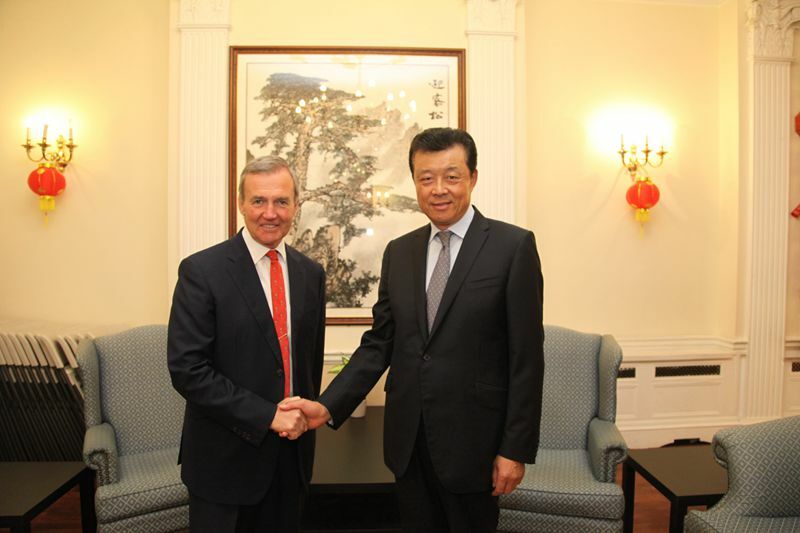 On 21 July, Chinese Ambassador Liu Xiaoming met with British Chief of Defense Staff General Sir Nicholas Houghton. The two sides exchanged views on developing relations between the two countries and their military-to-military relations. Defense Attache of the Chinese Embassy Major General Yao Min was present at the meeting. Ambassador Liu congratulated General Sir Nicholas Houghton on his successful visit to China not long ago, and said this year is a golden year for China-UK relations and an important year for developing military-to-military relations between the two countries. Since the beginning of the year, there have been close exchanges and frequent mutual visits between the militaries of the two countries. The Ambassador expressed his confidence that with the joint efforts of the two sides, the military-to-military relations would continue to deepen and provide new impetus to the overall bilateral relations. General Sir Nicholas Houghton said his China visit was a success and helped deepen the mutual understanding and trust between the two militaries. At present, China-UK military-to-military relations enjoy a good momentum for development, and the British side is ready to work with the Chinese side for more fruitful exchanges and cooperation between the two militaries.